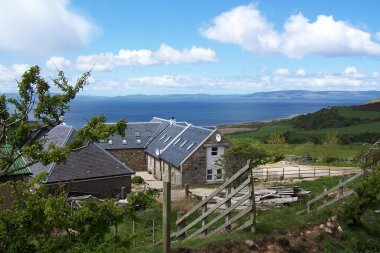 Home to a picturesque harbour and sandy beach, this small village boasts beautiful views of the Mull of Kintyre. Shiskine Golf and Tennis Club is also found in Blackwaterfoot, with a 12-hole golf course and two all weather tennis courts. Drumadoon Point is home to Arran’s largest Iron Age fort, and the King’s Cave is said to have been the refuge of King Robert the Bruce. 'Lighthouses' is situated on Ivy Cottage Farm, one of Arran's traditional sea-farms, and is an architect-designed conversion and extension of the farm's former stables and byre; it is named for the distinctive lights which dot the horizon at night.